Destin Florida and Walton County gifts shops, florists and holiday shops. Destin Florida gift shops feature unique merchandise. Flowers, plants, candles, lamps, linens, collector sets, original pictures, jewelry and holiday decorations await your discovery. Edible fruit arrangements also available. Award winning Destin Commons is the premier open-air lifestyle center for the entire family. With 90+ stores featuring favorites like Brookstone, Southern Living Store, Victoria’s Secret, H&M, Lush, Sephora, AMC 14 Theaters, Chipotle and World of Beer, Destin Commons offers the best in shopping, dining and entertainment! Boca Boutique and Galeri welcomes you to a great shopping experience. Offering three unique locations throughout the Destin and 30A area, we are a ladies source for fashionable apparel, footwear, jewelry, accessories, a wide array of gifts and artwork. Our friendly staff awaits your visit. 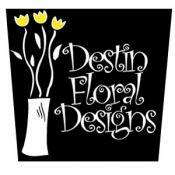 Destin Floral Designs is a boutique style florist and is the most award winning florist on the Emerald Coast. A full service florial designer providing flowers for all occasions including plants, gifts, wedding packages, handmade cards and home décor items. Providing daily delivery to Destin and nearby areas.